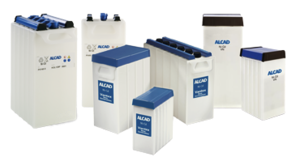 11 July 2012: Ive been talking to SAFT , Britain's leading supplier of industrial/solar NiCads, and I think they are linked to AlCad, as the call came as a result of an email and voicemail I sent to AlCad. It seems that the idea of a large NiCad battery will be too expensive for my off-grid system, as applied to a very small house. As a rule of thumb, they are about ten times the cost of the equivalent Lead-Acid. If this house was truly and entirely off-grid, the NiCad would be practical as the cost of about £1000 is in line with other costs in a new-build process, but for retrofit, it is too much, compared with about £100 for a deep charge Lead-Acid battery. As my system is one that I hope people will learn from and copy, it goes against logic to get something so expensive. It is justifiable to spend serious money on energy meters or data loggers, these are written off as a 'research overhead'. The operating components of a system must be cost effective if they are to be emulated. The house is already Net-Zero, so any additions to it are useful research tools, but are not essential to meet the target of Net-Zero. The only chance of getting a NiCad is to ask for one that is end-of-life as far as its first purpose is intended, e.g. emergency lighting in a large building, but having enough residual life for a small non-essential system like mine. I will ask some local businesses. My contact in Saft (who very kindly rang me to discuss the idea) will put my enquiry to possible sources of batteries for recycling.